Currently there’s only one vessel that can reach the North Pole, the nuclear powered ice-breaker 50 Years of Victory. On your cruise to the North Pole, watch (and feel, as the ship forces it way over and through sea ice) in amazement from high above the frozen surface of the Arctic Ocean surface, as the vessel’s twin nuclear reactors (generating 75,000 horsepower), powers the vessel through Arctic sea ice up to three meters thick. This is a one–of-a-kind trip with the single-minded goal of reaching 90 degrees North. There will be opportunities to view wildlife, including the polar bear. 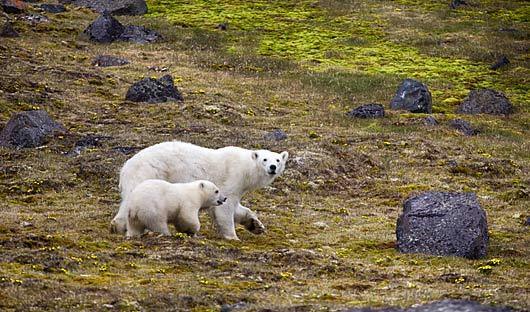 On the return journey to Murmansk you’ll visit Franz Josef Land archipelago, home to walrus, polar bear, seals and many bird species including the rare Ivory gull. “Unique” and “one-of-a-kind” are words often used in the cruise industry, but rarely do the voyages or the ships they’re associated with live up to these superlatives. 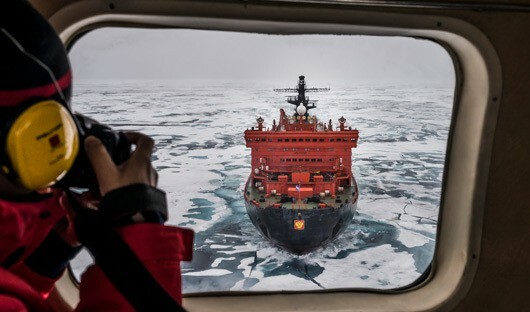 Here’s one that does: a North Pole expedition aboard 50 Years of Victory, a nuclear-powered icebreaker that takes you to a spot inaccessible to all other commercial passenger vessels. The 50 Years of Victory provides an opportunity for intrepid, adventurous travelers for whom geographic boundaries simply don’t exist. We’re the first to admit that there are many excellent expedition ships in the market, taking their guests to remote spots all over the globe. 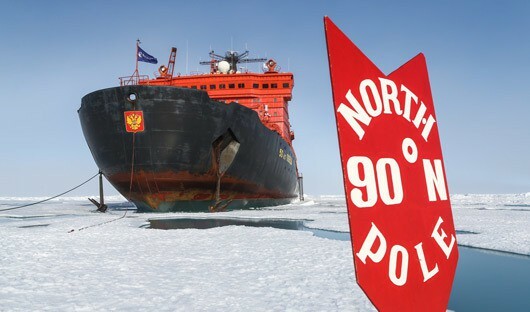 But only one vessel can deliver you to 90º North, the geographic top of the world. On your cruise to the North Pole, watch in amazement from high above the surface as your vessel’s twin nuclear reactors generate 75,000 horsepower, powering the vessel to crush Arctic sea ice as thick as three meters. Meet your fellow adventurers in Helsinki, and relax before a charter flight takes you to Murmansk, the Russian headquarters for thier Arctic icebreaking fleet. 50 Years of Victory is a working ship; when it’s not offering North Pole expeditions it is busy clearing ice for scientific exploration and transport in hard-to-reach areas of the Arctic and Northeast Passage. 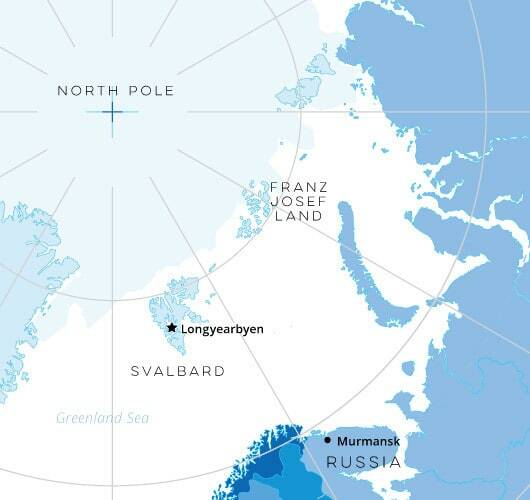 Franz Josef Land, is an archipelago consisting of 191 islands and is located in the Arctic Ocean, Barents Sea. Eighty-five percent of the archipelago is covered by glaciers. The landscapes are stunning and the islands have proven important in historical terms. The most powerful icebreaker ever built generates 75,000 horsepower and crushes multi-year ice layers three meters thick. After a few days aboard, you’ll feel her sharing power as you together battle your way through the Arctic icecap to 90º north. 50 Years of Victory is not a tourist ship. Rather, the icebreaker was purpose-built to pilot scientific and cargo ships to hard-to-reach areas of the Arctic and along the Northeast Passage. It is just during the short summer months when adventurers get a once-in-a-lifetime chance to travel aboard this real working icebreaker to the geographic North Pole.